Rigorous Numerics in Dynamics is a relatively new area motivated by the interest in converting into proofs the numerical results produced by numerical simulations of dynamical systems. With the availability of powerful computers and sophisticated software, one can nowadays prove the existence of particular solutions, such as equilibria, periodic solutions and quasi-periodic solutions, and branches of these solutions and their bifurcations in parameter families of dynamical systems, as well as the existence of homo- and hetero-clinic connections between invariant manifolds and chaos, and compute topological constructs as the Conley index and perform studies of topological and combinational nature. These computer-assisted proofs do require paper and pencil work, in order to reduce the problem to a required checking of finitely many inequalities. It is these inequalities that are checked by the computer in the final step of the proof, after appropriate coding. Pioneering work using these methodologies had been already done in the 80’s and 90’s, and there are important landmarks such as the the existence of the Feigenbaum renormalization fixed point by Oscar E. Lanford III (1982) , or the proof of the strangeness of the Lorenz attractor by Warwick Tucker (1999) . I would add pioneering papers by Valter Franceschini and Lucio Russo (1981)  and John E. Fornaess and Estela A. Gavosto (1992) , on existence of connections for Hénon mappings. To my taste, and for the sake of completeness, I would also add references to earlier computer assisted proofs in KAM theory, as the ones by Alessandra Celletti and Luigi Chierchia (1988) , by Rafael de la Llave and David Rana (1990) , and later by Ugo Locatelli and Antonio Giorgilli (2000) . In the last decade, however, the area has been revitalized. Some of those responsible for this new flourishing era of this field are the authors of the book under review. This volume is the proceedings of the AMS Short Course on Rigorous Numerics in Dynamics, hence the title of the book, organized for the Joint Mathematics Meetings in Seattle on January 4-5, 2016. In particular, this is a collection of lecture notes on some aspects of the applications of computers to perform proofs in the field of Dynamical Systems, in finite and infinite dimensional phase spaces, from Discrete Dynamical Systems and Ordinary Differential Equations, to Delay Differential Equations and Partial Differential Equations. The target audience of the book is, then, graduate students and researchers interested in theoretical aspects and applications of (rigorous) numerical methods in dynamics. Even though this is not specifically mentioned in the book, one easily envisages two different parts. The first part is what I will refer to as the Analytical Part, and encompasses Chapters 1-3, and 4. The second part is the Topological Part, corresponding to Chapters 5 and 6. (Numbering of the chapters is also not specifically given, but I introduce it for ease of reference). The Analytical Part makes extensive use of quantitative versions of Fixed Point Theorem and the Implicit Function Theorem, as well as versions of Newton-Kantorovich theorem. Classical treatises in which these type of results appear are Leonid V. Kantorovich and Gleb P. Akilov “Functional Analysis” , Serge Lang “Real and Functional Analysis”  or Ralph Abraham, Jerrold E. Marsden and Tudor Ratiu “Manifolds, Tensor Analysis and its Applications” . The authors add high value to their discussions by adapting and illustrating the results for non-trivial examples, by selecting the appropriate Banach spaces and Newton-like operators in finite and infinite dimensional problems, as well as in continuation with respect to parameters. 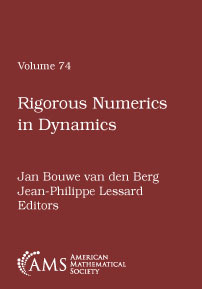 This part starts with an introductory chapter by Jan Bouwe van den Berg, entitled “Introduction to rigorous numerics in dynamics: general functional analytic set up and an example that forces chaos”. After presenting and introducing some basic concepts, and historical notes, the author introduces the general set-up to be used in Chapters 1-3, the so-called radii polynomial approach. This is a methodology based on Banach’s fixed point theorem. The simple idea is obtaining inequalities for the radii of balls around an approximate solution of a fixed point equation, for which there is a true isolated solution. The difficult part is developing such an idea to be applied to the full range of problems considered in this and the other chapters, choosing the suitable formulations and appropriate Banach spaces. In particular, in Chapter 1, and as a first application, the author demonstrates how topological braids can be combined with rigorous numerics to prove the existence of chaos in ODEs. The second chapter is Jay D. Mireles-James’ “Validated numerics for equilibria of analytic vector fields: invariant manifolds and connecting orbits”. After introductory and historical sections (that overlap those in Chapter 1), the author shows how one can go from the local information given by the invariant manifolds close to fixed points, obtained with the parameterization method of Xavier Cabré, Ernest Fontich and Rafael de la Llave (2003)  and Taylor expansions, to the existence of connecting orbits by using projected boundary value problems. Doing so, the author also explain rigorous propagation of sets of initial conditions by a flow, via Taylor methods. Many details and tricks are given, for the benefit of the reader. The very detailed examples center on the Lorenz system. The third chapter is Jean-Philippe Lessard’s “Continuation of solutions and studying delay differential equations via rigorous numerics”. In this chapter, the author extends the radii polynomial approach to the branches of periodic solutions in families of dynamical systems. Later, he applies the framework to the setting of DDES. In particular, he explains some steps to solve two important conjectures by Wright and Jones. Remarkably, the proofs of these conjectures have been completed only very recently (Wright’s conjecture by Jan Bouwe van den Berg and Jonathan Jaquette, and Jones’ conjecture by Jonathan Jaquette). The three first chapters have, then, the same flavor, but they consider very different problems. In each of the contexts, the authors develop from scratch from the very basic results (the radii polynomial approach) to the computer-assisted-proofs applications, in ODEs and DDEs, working in Banach spaces of coefficients (Taylor and Fourier coefficients, depending on the problem at hand). The authors give many practical details of their implementations, and even provide MatLab codes to be download by the interested reader. This detail should be very helpful to the target audience. The fourth chapter in the Analytical part is Thomas Wanner’s “Computer-assisted bifurcation diagram validation and applications in materials science”. The author describes in depth the rigorous computational techniques that can be used to validate bifurcation diagrams, based on quantitative versions of the Implicit Function Theorem and Lyapunov-Schmidt Reduction. In particular, he considers validation of branches, saddle-node and symmetry-breaking pitchfork bifurcations. He applies the techniques to a finite, but very high, dimensional DDS (coming from discretizing Allen-Cahn equation), and an example of PDEs from materials science (a diblock polimer model). The Topological Part consists of Chapters 5 and 6, in which rigorous numerics are based on algebraic topology and combinatorics. The two chapters share background on index pairs and index maps, isolating neighborhoods, outer approximations, and, most importantly, on the Conley index. Even though most of definitions are given, to understand this, a reader should have knowledge of concepts from algebraic topology, such as relative homology theory. It is possibly my fault that I find these two chapters more difficult to read. In the fifth chapter, Sarah Day’s “Dynamics and chaos for maps and the Conley index”, the author presents a succinct introduction to Conley index theory, an algebraic topological generalization of Morse Theory, to construct outer approximations, that are finite representations of discrete-time dynamical systems that are amenable to computational studies. One obtains then a coarse description of phase space, from which one can introduce symbolic dynamics. The example she considers is the Hénon map, for the classical values, using the software package GAIO. The author illustrates how to prove existence of periodic orbits and connecting orbits, as well as existence of invariant sets whose dynamics is topologically semi-conjugate to subshifts. Finally, the sixth chapter is Konstantin Mischaikow’s “Rigorous computational dynamics in the context of unknown nonlinearities”, in which the author considers the relevant problem of extracting information about a dynamical system whose generator (a map or a vector field) is poorly known. This happens for instance in biological systems, for which it is typically not possible to obtain accurate experimental data to fit parameters and to obtain precise models. The author presents an approach to characterizing dynamics that is based on combinatorial/algebraic/topological techniques. The goal is obtaining the dynamical structures in broad strokes, so that they can be tested with the experimental data. Having summarized the contents of the book, I would like to add a warning that the reader should not look for an organized textbook here, but a collection of chapters that extend the lectures given by the authors is a short, two-day course. Moreover, the authors have often collaborated, so they share the same language and techniques. This is both good and bad. The good is that each chapter is self-contained (and very detailed), and one can see, for instance, how the same framework can be applied to very different contexts and problems in DDSs, ODEs, PDEs and DDEs. This is one of the main advantages of their approach. The bad is that there are many overlaps: notations and basic results are repeated in different chapters, and the subjects and techniques cover a small part of the literature. This bring to my mind the pioneering proceedings “Computer aided proofs in analysis”, edited by Kenneth R. Meyer and Dieter S. Schmidt (1991) , that covered a wider spectrum of problems and methodologies. Nevertheless, even though the contents are biased to the specialities of the authors, they partially palliate this bias with relatively long introductory historical sections, and rather complete bibliographies (but with the natural overlaps, and a bit disorganized), referring to the larger scope of the field. Overall I welcome these proceedings to the literature. The reader can learn from theory to rigorous computations in many contexts of dynamical systems, and get a lot of insight from the many worked and far-from-trivial examples (that include available software!). This book would be an excellent starting point for students and researchers to learn from zero about recent results and methodologies in the field of Rigorous Computations in Dynamics. I would encourage these authors to write a textbook on the field, beginning from these good strands. Cabré, Xavier; Fontich, Ernest; de la Llave, Rafael. The parameterization method for invariant manifolds. I. Manifolds associated to non-resonant subspaces. Indiana Univ. Math. J. 52(2) (2003) 283-328. Celletti, Alessandra; Chierchia, Luigi. Construction of analytic KAM surfaces and effective stability bounds. Comm. Math. Phys. 118 (1988), no. 1, 119-161.
de la Llave, Rafael; Rana, David. Accurate strategies for small divisor problems. Bull. Amer. Math. Soc. (N.S.) 22 (1990), no. 1, 85-90. Fornaess, John E; Gavosto, Estela A. Tangencies for real and complex Hénon maps: an analytic method. Experiment. Math. 8 (1999), no. 3, 253-260. Franceschini, Valter; Russo, Lucio. Stable and unstable manifolds of the Hénon mapping. J. Statist. Phys. 25 (1981), no. 4, 757-769. Lanford, Oscar E., III. A computer-assisted proof of the Feigenbaum conjectures. Bull. Amer. Math. Soc. (N.S.) 6 (1982), no. 3, 427-434. Locatelli, Ugo; Giorgilli, Antonio. Invariant tori in the secular motions of the three-body planetary systems. Celestial Mech. Dynam. Astronom. 78 (2000), no. 1-4, 47-74. Meyer, Kenneth R.; Schmidt, Dieter S. (eds.) Computer aided proofs in analysis, The IMA Volumes in Mathematics and its Applications, 28, New York, Springer-Verlag, 1991. Tucker, Warwick. The Lorenz attractor exists. C. R. Acad. Sci. Paris Sér. I Math. 328 (1999), no. 12, 1197-1202.